Happy Birthday Antenna TV! This January, Antenna TV, Tribune Broadcasting's digital multicast channel, enters its third season on air with clearances on 70 television stations across the country, reaching 61% of TV households, as it turns two years old on Jan. 1. When Antenna TV launched on January 1, 2011, the network made its debut with The Three Stooges. Sticking to that tradition, Antenna TV now airs a Three Stooges Marathon each year on New Year's Day to commemorate the anniversary. This January 1, the marathon will air from 7am-3am ET on New Year's Day. Whatchoo talkin' bout? 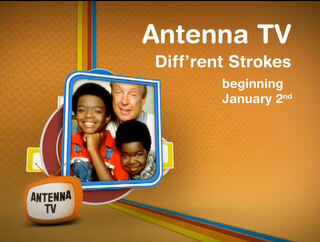 The very next day, (Wednesday, January 2, 2013) Antenna TV will add the classic '80s sitcom Diff'rent Strokes to its regular lineup! We hinted that a new show would be coming in January, now it is official! 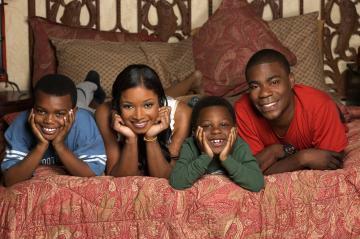 The Gary Coleman sitcom will be airing Mondays & Wednesdays from 9-11pm ET and also on Sunday nights from 10-11pm ET. In addition, current Sunday night staples, WKRP in Cincinnati and Barney Miller, will be moving to weeknights this January! Antenna TV will also add Antenna TV Theater, a Saturday night primetime movie block. We will have more on the actual schedule for January next month, so stay with us! Antenna TV's 2013 lineup includes classic favorites such as: Leave it to Beaver, Dennis the Menace, Father Knows Best, Adam-12, Dragnet, The Partridge Family, Good Times, Sanford and Son, Maude, Hazel, Benson, All in the Family, Diff'rent Strokes, WKRP in Cincinnati, Barney Miller, Alfred Hitchcock Presents, The George Burns and Gracie Allen Show, Jack Benny Presets, Gidget, The Flying Nun, The Adventures of Rin Tin Tin, The Monkees, S.W.A.T, Bachelor Father, McHale's Navy and It Takes a Thief. There are a few current shows missing from this list, but that doesn't mean anything until we see the schedule itself, as this is just a select list of shows. One show we know that will be "resting" for a bit starting in January will be Three's Company as it has aired the most on the network for the last two years. We hope it will rest up and be back later in 2013, but of course you can still watch it right now until the end of December (Mon-Thurs 7-8pm and 11pm-12am ET). In addition to Tribune and Local TV, since its launch in 2011, Antenna TV has partnered with several broadcast groups including Cox, Gannett, LIN, Media General, Capitol Broadcasting, Hubbard, Gray, Raycom, Sarkes Tarzian, Journal Broadcast Group, Intermountain West, Morris Multimedia, Block Communications, Woods Communications Corp and Paxton Media Group. MTV2 has picked up two more sitcoms for its line-up, but this time two short-lived series. Short-lived comedies The Tracy Morgan Show and The PJs have been added to the schedule, both airing once a week in late night blocks. They were actually added to the schedule last week. The Tracy Morgan Show will primarily air Wednesday nights (early Thursday mornings) from 2-4am ET and The PJs will primarily air Thursday nights (early Friday mornings) from 2-4am ET. Both comedies were last seen on cable network TV One. In fact, Tracy Morgan Show still airs on TV One on Saturday mornings. These comedies won't air daily like the other MTV2 sitcoms like Saved by the Bell, Boy Meets World, Martin and The Wayans Bros., but it is good that they are at least airing them once a week. MTV2 also started airing That '70s Show from time to time in the late night, since MTV stopped airing it. The Tracy Morgan Show and The PJs will be airing more than Malcolm & Eddie and In Living Color, as those two only air from time to time now on MTV2. The Tracy Morgan Show is about a family man who lives in a small Brooklyn apartment with his wife and two kids deals with the daily headaches of working at an auto garage while dreaming of expanding the business. The PJs is an animated comedy that follows the adventures of the Subbs and their friends, while taking a satirical view of the ups and downs of life in a big-city housing project. The series comes from Eddie Murphy.